You’re developing a WordPress Theme and you want to have an options page. Maybe you want to give a client the ability to manipulate specific pieces of information, such as a phone number, which when updated in the backend goes through your theme and updates the phone number in various places. I’ve used it for this, for editing different blocks of content on a homepage that doesn’t conform to simply “the_content”, and for setting up an ad system, such as with DoubleClick for Publishers, so that my clients can login and update the code required for their <head> section and the individual ad blocks. I’ll walk you through exactly how to do that here, and keep it as simple as possible, as this is one area where WordPress still gets a bit complicated even to us seasoned professionals. The first thing we’ll do is review the specific code you’ll need to add to functions.php. You could also add this as a plugin if you wanted it to work across themes, but for today’s purposes we’ll assume this stuff is very theme-specific and therefore more appropriate for functions.php. Let’s dissect the code above though so you can see what we’re doing and how you can modify things to your liking. First we start by creating the function that will house all of this. Then we add to that function the stuff that makes up a typical WordPress page. The icon-tools class just adds WordPress’ Hammer & Screwdriver icon, a fitting one for a settings page I suppose. You can change the contents of the <h2> section to suit your needs, as well as the following <p> tag. In fact, you could add just about anything wanted above the opening form. Within that form, we then have <?php settings_fields('theme_options'); ?>, which, along with the do_settings_sections line below it, pulls in the values and sets up the framework to start showing off our fields. The next two lines ensure our code will be run everytime a user loads up WP-Admin. admin_init basically fires off some code before any other hooks are triggered, and must be tied to a specific function. In our case, the register_and_build_fields function. Let’s look at the various lines inside of that function. Here we create an entire section for our settings. In the full code above, I’ve created two sections, one for “Homepage Settings” and another for “Footer Settings”. These are displayed on the same page, just in two different visual sections on the page. The initial homepage_settings will be used later, when we create fields, to tell those fields which section to hang out in. The next parameter is the displayed text for that section. The third parameter is the “callback”, essentially, the name of the associated function which will fire this off. Finally, we use the __FILE__ to simply tell WP that we want this to happen on the page we’re working with. Next up we just make the function to trigger the callback mentioned above. Now that we’ve got the page setup and a section created, we’re ready to start creating our various fields. There are two steps to this, the first being to use add_settings_field to define our various fields. Below I’ve defined a button1text field and a button1link field, which could allow an admin to enter some text and a URL, to then be used on the front end to display a button. More on displaying these options later. The first parameter of add_settings_field is the ID of the field itself. The next parameter defines the fields’ label. The third parameter is the callback which we’ll use in the next step. Again, we then tell it to use __FILE__ to say “we’re talking about the page in question”, and finally, we tell WordPress which section, homepage_settings, of this page to add the field to. Next up, we start creating the actual inputs and textareas to be displayed on the settings page. The following creates a text input with the value being set to whatever button1text was previously saved as. Initially it will be blank, but once an admin saves some content, it’ll be prepopulated from their on out. See our button1text_setting callback in there? We set that with add_settings_field above. You can create as many of those as you’d like, of course, but remember that to create any one individual setting, you need both the add_settings_field to define everything, and then a function with that settings callback to create the output that admins will see. 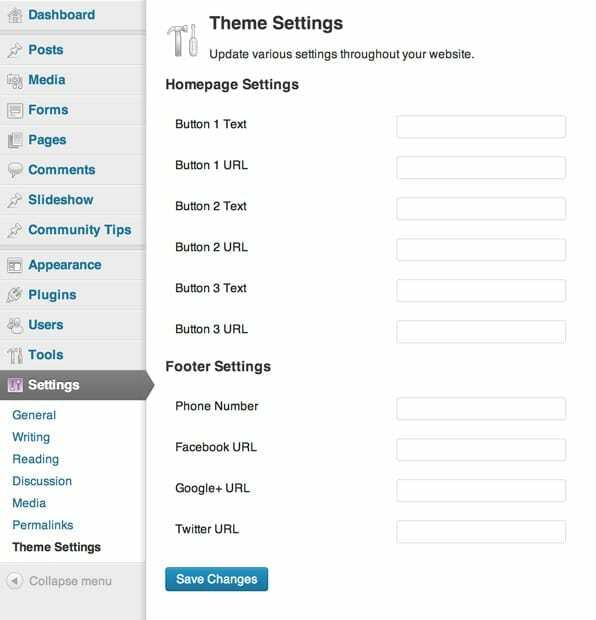 Essentially, we just tell WordPress, do us a solid and add this page to the Admin area. Now that we’ve got a settings page up and running that actually works, let’s look at how to display settings on the front end of the site, which is considerably simpler now that we’ve prepped everything in the backend correctly. Then we can use it in real world scenarios. Remember how we were setting button1link_setting and button1text_setting above? Now we can spit those out into an anchor tag and create a custom link that admins can define. Creating settings pages is, maybe after plugin creation, one of the trickier aspects of working with WordPress, but stick to the game plan above and you’ll be thanking yourself later when your clients need to be able to globally change phone numbers or want to have a bunch of different content sections on the homepage. Hi Nathan, great tutorial. It seems as though the number of peeps who know this stuff is quite small and those who understand it enough is even less. I have followed what you have done, got the heading to show in the main dashboard area but cant get the actual page to load. I am sure its a typo but i’ll be damned if I can find my mistake. Is there any way you could email me the code as this is just what I need and I do want to get your way working. I’ll understand if you don’t but would be great if you could – or maybe include a link to to file. Thanks for this excellent tutorial, Nathan. I’m comfortable enough with fiddling with PHP in WordPress but some of the other theme options tutorials I’ve looked at have just made my eyes glaze over. In this one, you’ve laid everything out in a clear and simple way. @Ian: Have you tried just directly copy/pasting my code and seeing if it shows up before making any modifications? That’s always my first step when faffing with some tutorial, but I’ve used this as the basis for three themes in the past months and it works perfectly for me. And @Peter, THANKS! Glad to be of service. Thanks for a great guide, worked perfectly for me, much appreciated! I’m working on a WordPress settings page that has a radio button with 2 given options ‘yes’ or ‘no’ but it doesn’t seem to retain the chosen option, it deselects after a refresh. It’s of great importance that the chosen option stays selected because it triggers the display of an element. I’ve researched and experimented with the PHP function below but it still doesn’t retain the chosen option. I’m using your code examples. Checkboxes and radio buttons require some extra work which I haven’t actually delved into just yet. If you figure out the solution feel free to post it back here and I’ll be happy to send credit your way. Noted Joki. Lots of what I post around here can be duplicated with plugins, I provide this info more for theme developers who want to include things without the need to also package a plugin or tell people to download a plugin along with their theme. No problem Nathan. I abandoned it for a while bur I’m back on it again. Thanks for your response. Beautiful simple tutorial, I just have one question, how I can have a default value already on this fields? right now on theme activation they are all blank and the value will get saved as soon as we enter something on the fields but how I can have a default value for each field? If I add a default value like $options[‘googleurl’] = “http://google.com”; then when I write the new value it will not get save and always revert to the pre-set value. Thanks a lot for you time. That should say “if the googleurl option is empty, set it to http://google.com. However, that would also prevent you from ever setting a blank value, if that was desired. It most certainly does work, Abid. I use this code on every single WP theme I create. Make sure you follow the directions exactly. Best of luck to you. Awesome Tutorial. Thank you so much! HOW can i adapt your code (last two lines to set up the options page) to show “Theme Settings” under “appearence” and NOT under “settings” in the backend? I would also love to know how to add this as a subpage of “Appearance” rather than “Settings”. Thanks for the info! Which obviously isn’t the correct page. I’ve pasted your code exactly. Hard to say, Chris. I just used it on a theme today and it’s all running correctly for me, latest version of WP. Further to my last message, replacing “__FILE__” with a string such as “custom_options_slug” works. Am I correct in saying “__FILE__” simply uses the current admin page? Why would that be used? Could you help me in creating theme options for color options. Abi, you may want to look into the plugin that Joki linked to above, and see how they do it. I don’t include color settings in my theme options as every site I make is tailored to a specific client and their needs, so I don’t have need to give people lots of options like that. because only theme setting option show then click i cant link right …. Awesome tutorial. Love how you give the code but give thorough and detailed explanations afterwards. Jeel, not sure what you’re asking specifically, but yes the code is copy & paste. Rach, thanks! When I was getting started I always found it useful to know what everything was doing vs. just using it. Helps to learn how to tweak, and eventually write, the code for yourself! Exactly – even the small things people have trouble with. How would I go about moving this from underneath the Settings menu? I don’t want clients access to the rest of the settings but obviously access to these fields. I’ve tried using user admin role & setting it that way, but this option seems to disappear if I remove any of the other options under settings. Any help would be much appreciated 🙂 Thanks Nathan. Changed the add_action to this…. Hi! I just wanted to post why I think some people are having difficulty when they copy and paste the code. I was having the issue that the theme settings link was going to /wp-admin. When i replaced __FILE__ with _FILE_ (Note I removed one of these on each side _ ) it worked perfectly. Thank you for the tutorial! I love diggin into this stuff. I always find it funny when people suggest plugins when you are searching for ways to learn how to do it yourself. This is how you learn as a developer, not by using a plugin. Anyway! My two cents. Thanks again!! I was looking all over for a tutorial like this! All I wanted was a simple text area for phone numbers and such. All the other guides seemed way too complicated. Thank you. First off, super nice tutorial! I followed everything right up until it came to the get_option portion. When I try to echo $options nothing shows up. I’ve kept your block of code for functions.php pretty much the same except I removed all of the unused “add_settings_field” lines as well as the footer_settings one and the function for it. Not sure if any of this could have screwed something up, but if you could help me out real quick, I’d really appreciate it! I’m guessing your code didn’t fully come through, Jared. Feel free to try and post any php with [?php type tags instead of actual code, WordPress is probably just stripping everything out. insertion. It seems like I have to call it in each .php file in which I use it. i.e. if I call it in sidebar, I also have to call it in footer. Is there a way to make it some kind of universal call? I tried header.php and as a wp_head call functions.php, of course. I think that’s what the previous questioner was asking about. It was a really helpful tutorial–I mixed it with lots of time on the codebase and I think I have it working. Yeah, you do have to call it each time. You could setup a function to do this, and a parameter could be one of the option fields. Glad you liked the tutorial. For something like that, well, I’m a businessman.